Welcome to Freykirk – population, 266. A quaint, rural, yet affluent village where everybody knows everybody else and the locals are not afraid to leave their doors unlocked at night. Living in a small village and seeing scarecrows dotted across the landscape they do make an eerie sight when the sun starts to go down and their shadows loom over the countryside. With that in my mind when reading this latest book from author Duncan Thompson, I was hooked as I turned every page to explore the goings on in a small village much like the one I live in. 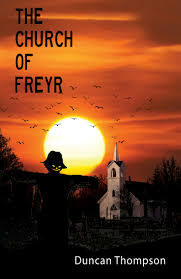 The small village of Freykirk sounds like a quaint little English village but all is not what it seems. The character of Cage Roberts makes for an interesting character to follow throughout the book. Taking the idea of something as innocent as the village scarecrow competition, Duncan Thompson has made it a macabre festival that just makes you wonder..could this really happen? It is clearly influenced by British folk horror films such as THE WICKER MAN (1973) and THE BLOOD ON SATAN'S CLAW (1971) but that can be seen as nothing but a positive. In his 'Dark Places' books there is a supernatural element running throughout the three books but here the story has more of a sinister human element about it involving the occult. I would highly recommend you pick this book up and his previous books as Duncan Thompson is an author that will definitely be one to follow.